My whole family prefers white sauce over red with our pasta. But buying jarred sauce just doesn’t fill the craving from that restaurant quality taste. Plus, making your own Alfredo sauce from scratch is surprisingly easy and quick and uses just 4 everyday ingredients. In a small sauce pan or skillet melt butter with added roasted garlic. Whisk while slowly pouring in the heavy cream. Continue to whisk until everything is blended. This set of 3 whisks is perfect, and you can’t beat the price! Remove the sauce pan from the heat. Add and whisk in the cheese until the cheese is melted. Add salt and pepper to taste. 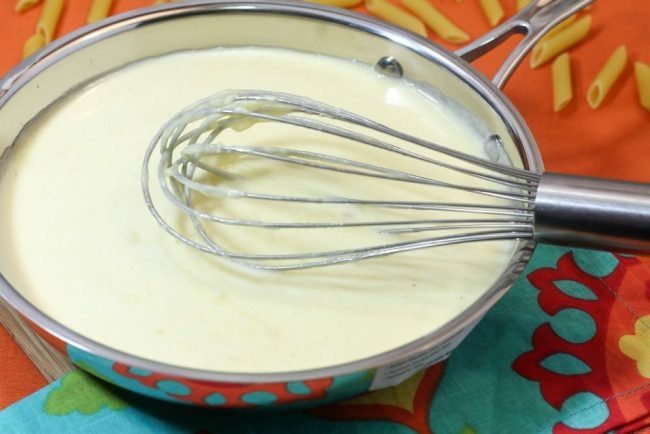 If mixture is too thick add more heavy cream until the sauce reaches the desired consistency. 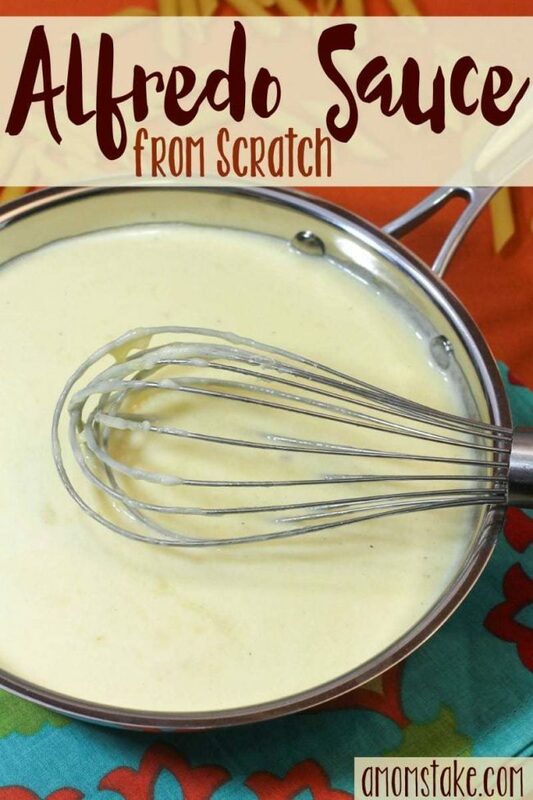 Make your own easy, homemade Alfredo sauce with this from scratch recipe! In a small sauce pan melt butter with added roasted garlic. Remove the sauce pan from the heat. Add and whisk in the cheese until the cheese is melted. Add salt and pepper to taste. If mixture is too thick add more heavy cream until the sauce reaches the desired consistency. Want another amazing from-scratch recipe? Hop on over to see our Easy Pizza Sauce recipe next! 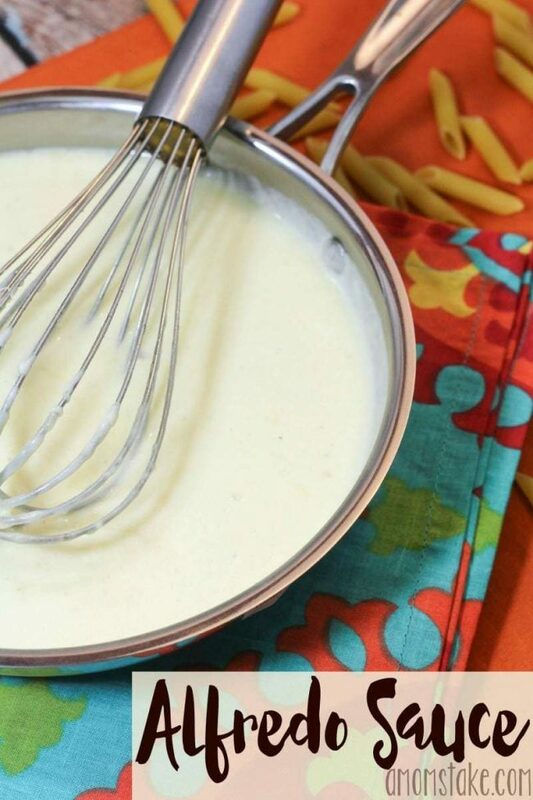 Let us know if you try our Homemade Alfredo Sauce recipe in the comments! Previous Post: « How to Set Goals (You Will Actually Stick To)! I am a huge fan of Alfredo sauce. Thanks for sharing on the #HomeMattersParty I hope you will join us again next week. Yes, homemade Alfredo cannot be beat. My hubby makes it at our house and his recipe is similar to yours so I know it’s delicious. Pinned to the Merry Monday party board. So glad you shared. Very nice recipe and very easy to make. I usually make it with flour added to the butter but this is much easier. I’ve never made Alfredo sauce but I LOVE eating it- Pinning to make! My family really likes alfredo sauce. I have never tried this recipe before. I am going to have to try it! It looks easy and sounds so good. My family loves Alfredo sauce. I always make it from scratch because it tastes so much better! What a quick and easy recipe. I have never used haf half before to make it but cream cheese instad. I will have to try this one! That sounds so yummy! I love a good alfredo, so I’ll definitely be trying out this recipe. 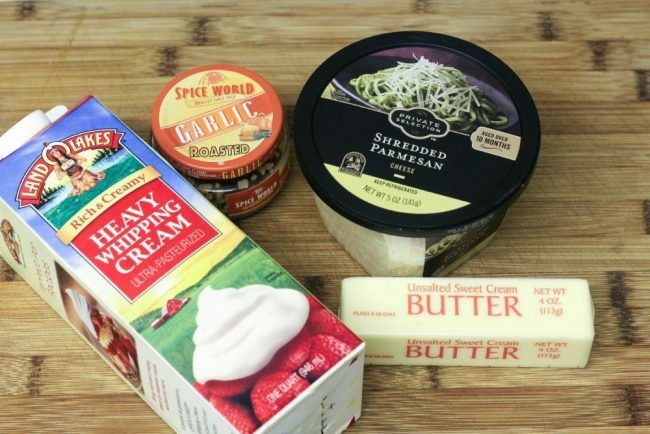 I never thought of making Alfredo sauce like this before!! It sounds so quick and easy to do, I bet it tastes amazing too!